Here is something not often found. Just on 1 year old and all the hard work has been completed. On offer is an as new luxury houseboat with 2 bathrooms and 3 bedrooms, all with queen/double beds. The vendors have spared no expense on the fit out and furniture choices. This is an ideal option for someone looking for a new houseboat without going through the building process and waiting time. Gone Mad is a very spacious 3 level Houseboat which has just come out of Anchorage Houseboats boat shed after a major refurbishment. At that time the pontoons were serviced and painted, a new 3rd level deck was fitted with free spanning hard top, and the HB was freshly painted. The layout of this houseboat is impressive with large proportions with 3 walk around beds, offer sleeping accommodation for 10 comfortably. We are proud to offer “Alchemy” for sale, built by Anchorage just over 1 year ago and was built to a high level of finish. The décor is tasteful and styled in soft neutral tones. Once on board you will appreciate the space and accommodation on offer from the master king bedroom with full ensuit and the marble tiles in both bathrooms. Sorrento is a unique classic Eildon houseboat that has been well maintained and upgraded since she was first built. This beautiful houseboat offers an abundance of living space with an large alfresco rear deck which comes off the open planned rear lounge room. Here is an opportunity to secure a new houseboat that requires a few finishing touches. Built and launched in 2017 for the current owner and built by well known Anchorage houseboats. This is a great way to save money and going through the waiting time for a new build, allowing you to have this new boat now. Here is a unique opportunity that doesn’t often become available. Just less than a year old, “ENVY” offers 5 bedrooms all with air Cond and the master with private ensuit. The large second bathroom services the other 4 bedrooms while the 2 powder rooms offer guest conveniences. Bellagio was built in 2008 by the current owners. Offering 3 good size bedrooms and a big rear lounge will provide a new owner with comfortable living. The upper deck area is also large and spacious with a second Helm. A entertainers hot plate/grill is in built to the cabinetry along with bar fridges and much more! This is an immaculately presented houseboat that has recent renovation undertaken in 2017/2018. As you can see by the photos the layout is unique offering two master bedrooms with queen beds and ensuits. The third bedroom offers a double bed which also has a built in robe and ceiling fans in each bedroom. Revelation brings a distinctive design to House boating when she was built in 2001 by Neil Little for the current owner. Recent renovations in 2016 have enhanced the design and added a large entertainment area to the rear deck of the houseboat which is not often found in the market. The interior is sleek and stylish that integrates timber and leather with modern practicality. While all the spaces flow one to the other, privacy is allowed for owners and guests and the 3 levels blend together beautifully. Watermark was built by Status luxury Houseboats in 2010 by the current owners. At this time the owners spared no expense in fitting her out and she is now on offer to a new family. This is a quality Vessel with uncompromised quality, the inclusion list is extensive and impressive. The 3 bedroom layout provides comfortable accommodation for 8 in beds. Here is an opportunity to buy "No Big Deal". Built in 1999 for the original owner L. Cretella who spared no expense when she was built. The current owners have maintained her well and is now available for a new owner. Once on board you will appreciate the quality timber fit out and open planed layout allowing room to entertain guest and family friends easily. The 3 bedrooms are of good size and the main bedroom is spacious and large with a second toilet. "No Big Deal" runs twin 4.3lt Mercruiser motors and operates a Kohler Generator. Leading Edge is one of Lake Eildon's iconic houseboat being 57 feet in length. The current owners in 2014 undertook major renovation and upgrades which will provide the new owners with many more years of luxury house boating. The attention to detail can only be appreciated once onboard as the pictures don't do her justice. Restless is a 60×20 luxury Super boat. Having just been slipped and grey water fitted will enable the new owners to get onboard and enjoy this outstanding vessel. 3 spacious bedrooms with the master having a large ensuit bathroom. The boats is finished and presents in immaculate condition. Fugitive is an extremely well appointed house boat with hardtop and features a large list of quality inclusions. You will find a spacious master bedroom with an ensuit effect to the main bathroom. The higher than normal ceilings with cedar inserts provide a feeling of grandeur. Rehab was built in 2012 and has just been slipped, at this time the Grey water system was installed and front and rear thrusters to make handling and maneuvering a dream. Rehab has a modern décor and styling with 3 spacious bedrooms which sleeps 8 in comfort. EZE is a Prestigious 3 level houseboat and is recognized by her well balanced classic exterior lines. The elegant nautical fit out is bright yet practical which will impress a fastidious buyer. The owners have maintained this Luxury Houseboat at no expense which shows when you walk through. The accommodation will suit a large family in comfort allowing the 5/6 bedrooms layout to accommodate 12 in beds, the master state room having its own private bathroom and deck area. The twin engines with moorse controls and bow thruster enables EZE to be maneuvered easily and with confidence. We are offering one of the larger 50 foot houseboat that is available on Lake Eildon. The extra length creates an amazing amount of space and comfort. The décor of this houseboat is styled with warm timber walls and floors with a Mediterranean finish . The family and guest will enjoy the massive living spaces and the convenience of two toilets, spacious bedrooms and the upper deck spa tub. This magnificent 4 bedroom 10 birth houseboat with state room and ensuite will impress you once on board. The interior fit out is stunning and modern with warm colour tones throughout. With an extensive inclusion list and updated electrical system Metis will cater easily for all your friends and family. 3 levels of zoned living spaces creates spaces to relax and get away from your busy life back in Melbourne. St Tropez offers a new perspective on Lake Eildon in the luxury houseboat market. This is wider and longer than the standard traditional houseboat changing the boundaries in bedroom size and living spaces. The result is an abundance of luxurious spaces on both levels offering the finest in comfort and quality found in an Anchorage built houseboat. You will be guaranteed “Satisfaction” after you have inspected this immaculate large 3 level houseboat. These Houseboats are iconic to Eildon and are well known for the space and accommodation they offer. Satisfaction is no different however the current owners have maintained her to a high standard. The inventory list is extensive, with only the best of the best componentry installed. This is an impressive vessel that has just had a major refit and upgrades completed. Whilst in the slip yard the leg was serviced and reconditioned, new alucabond cladding installed, new kitchen and bathrooms with stone bench tops were installed. The list of works is large. If your in the market for a large spacious House boat with 2 large rear lounge rooms and require 4 bedrooms and 2 bathrooms then this is a must see. Cookabbara was built in 2004 and offers 3 bedrooms and 2 bathrooms. The layout also offer two large rear lounge rooms on both levels and is complimented with an abundance of inclusions. Ultimate was built in 2009 and was lasted slipped in 2013. Beautifully appointed throughout and attention to detail is a reflection of the quality of a Status built Houseboat. Once on board you will enjoy the décor and layout along with the inclusion which includes a large 6 seat spa for the family and friends to enjoy, located on the upper deck. 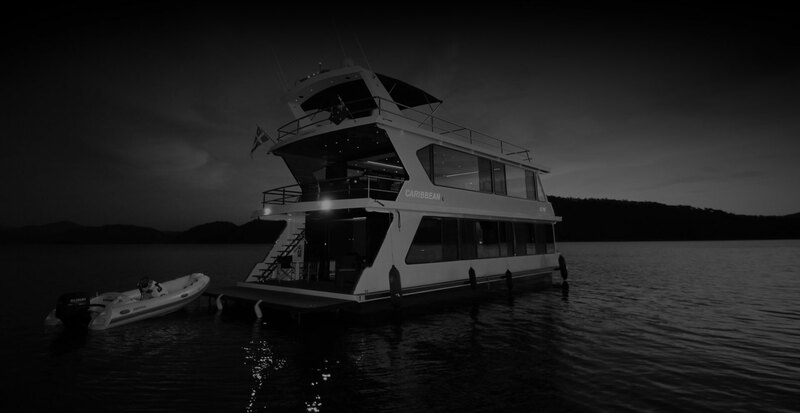 Caribbean is renowned for quality and represents the ultimate in luxury house boating on Lake Eildon. Walking through it is easy to be overwhelmed by the attention to detail and finish. The exciting design provides 4 spacious bedroom accommodation and 2 luxury bathrooms with an adjacent laundry and separate cellar and work space. Space, space and more Space. 3 levels of luxury and style. Huge living areas both indoor and out doors. Not often found but sought after is a large stateroom with a walk around King bed and a walk-in robe opening into a private ensuit bathroom and sun deck. The current owners have spared no expense when they renovated this luxury houseboat back in 2016. At that time the renovations included an extension of the rear deck with a larger full size duck board and two large side duckboards. Other improvements were new batteries and Electrics with a full interior fit out. Millennium is an impressive 45×20, 3 level houseboat built by well know boat Builder Neil Little in 2000. You cant help but be impressed and be taken back with the list of inclusion incorporated in this immaculately presented houseboat. Once onboard you will be impressed with the timber fit out as it is stunning and the exceptional quality, all accompanying quality furnishings and decor. You will be impressed with the large open planned living spaces on both levels and the up stairs area also lends its self easily to add in 2 more bedrooms if required. Contact Ray from House Boat Sales Lake Eildon to arrange an inspection or for more information on these premium houseboats.